Enchiladas is a mexican dish made of tortilla and stuffed with any sort of filling right from meat to vegetables. Originally made of corn tortilla, which is a flat round bread much like a chappati was rolled around a meat or fish. Over the years it has been made in lots of ways with different sauces, toppings and fillings. The first time I had enchiladas was at my cousin Sailubhai’s house years back. Chandrabhabhi had made them when she invited us for dinner. Since then I have made enchiladas using ingredients available at local market. Use any filling and sauce to make these yummy and filling delights. I have to make the tortillas at home as we do not get ready made ones easily. You can buy the ready made ones if available. Sieve flour with baking powder and salt into a bowl. Form a soft dough using at first ½ cup water. Add more if required. The dough should be soft but not sticky. Divide the dough into 16 parts. Roll each one into a 6 to 7 inch diameter circle using extra flour. Cook the rolled out tortilla on a hot pan on both sides. Keep it wrapped in a cloth or kitchen towel. If you are using fresh beans, wash and put them in a pressure cooker. Add just enough water to cover the beans. Add the salt. Cover the cooker and cook the beans for 3 whistles. Drain out the beans and save any water if is there is any. Lightly, mash up the beans. Stir fry the onions till they become light pink in colour. Add the garlic and stir fry for a few seconds. Add the tomato puree, chilli and coriander powder and mix well. Cook the puree for about 5 minutes. Add the beans and ½ cup of the saved water or normal water if using canned beans. Mix and cover the pan. Let the beans cook for 5 minutes. Heat oil in a pan. Stir fry the onions till they are soft and light brown in colour. Add the garlic. Saute for 30 seconds or so. Add the red chilli powder and coriander. Immediately add the tomato puree, salt and sugar. Mix well and cover the pan. Let the sauce cook till it becomes a bit thick. Mash the avocado with a masher or fork. Keep in the fridge till required. Take a tortilla and put a bit of the filling in the middle. Cover the filling with the ends of the tortilla and place it in a baking tray or dish. Spread a bit of tomato sauce over it. Repeat with the other tortillas till the baking dish is full. Sprinkle grated cheese over the stuffed tortillas. Bake in a hot oven at 200°C till the cheese melts or if in a hurry, place the tray under a hot grill till the cheese melts. 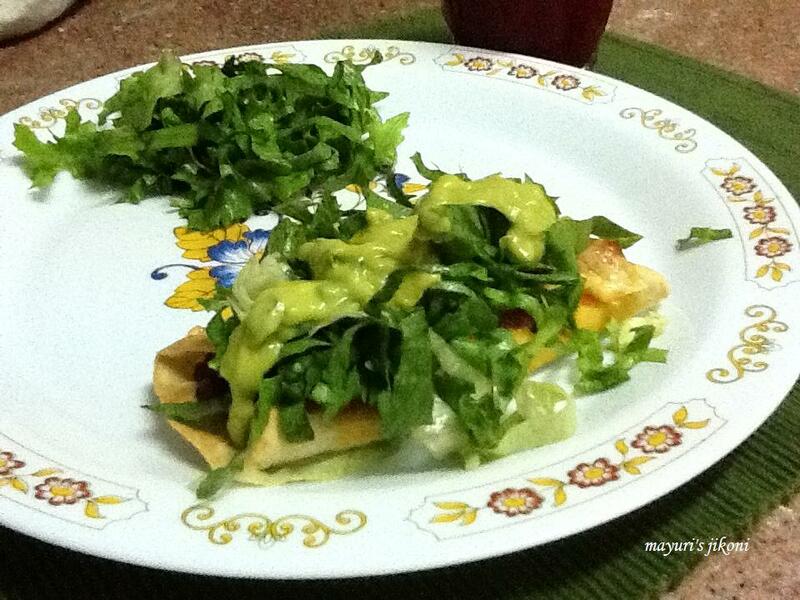 To serve, place a bit of lettuce on top of the grilled enchilada. Top up with a bit of guacamole. Can make a filling from ricotta cheese, spinach and beans. Use salsa sauce instead of the one mentioned above. Spread sour cream on to each tortilla before adding the filling or serve it on top instead of guacamole. The baking powder and butter in the tortilla makes it soft and not chewy like the ready made ones. Use half plain flour and half wheat flour to make the tortillas. To prepare fresh tomato puree check out the recipe on dal makhani.